Some great feedback from our satisfied clients in Bebington and across the country. "I received a call from Richard Preece within five minutes of making an inquiry. The call helped me decide what type of survey would be appropriate. The survey was arranged within the week, with results e-mailed to me on a Friday evening and a paper copy posted. The survey – complete with relevant photos – was very informative. In particular, it highlighted a major issue that we had not been aware of, and which we’ve been able to take up with the vendor. Seems like money well spent." "I was going to buy a holiday property in Wales. Although managing everything from Germany, with the help of Mr. Preece I was able to get a very professional Survey in short time. His Service is prompt, friendly and extensive. I would always choose him again." Providing a full range of building surveying services to owners and occupiers of residential, commercial and industrial premises in and around Bebington, the Right Surveyors fundamentally understand that each client has different budgetary and unique property requirements. Give us a call on 01244 424 243 or Freephone on 0800 880 6024. Chartered surveyors covering Bebington, Port Sunlight, Spital, Bromborough and the surrounding areas. 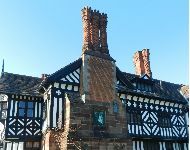 Read our latest monthly property newsletter for news, information and building surveying advice from our network of property surveyors including our Bebington Chartered Surveyors and property valuation consultants.